Tim Burton movies are easy to pick out from the rest of the movies you may have seen. They are quirky and dark. They tell stories in a way you will remember them. His first big screen movie was Pee-Wee’s Big Adventure. From there, he directed Beetlejuice, Batman, Edward Scissorhands, and Batman Returns. Then he conceived the cult classic The Nightmare Before Christmas. The Nightmare Before Christmas is a stop-motion animated film. The dark fantasy musical tells the story of a disenchanted Jack Skellington (Chris Sarandon) as he tries to fill an emptiness in his soul. Throughout his journey to Christmas Town to trying to bring joy to people he doesn’t understand, Jack Skellington fumbles his way back to a realization he didn’t know he wanted. It’s time for the latest Reel Leadership article. 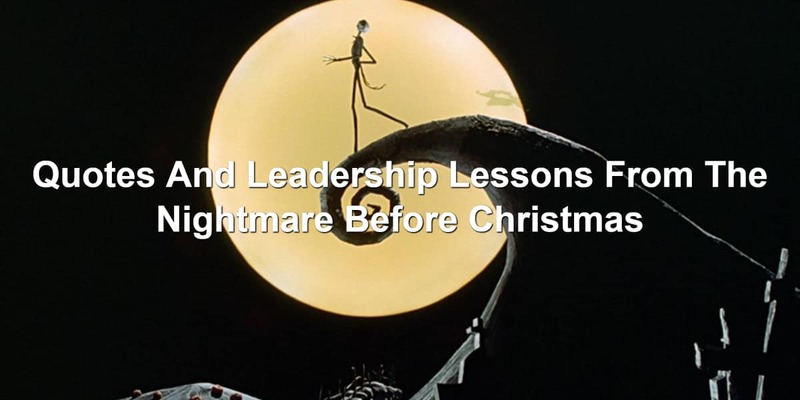 Will you join me on the journey through The Nightmare Before Christmas as we explore the leadership lessons you will find? It’s our job but we’re not mean. The citizens of Halloween Town were singing a song after their recent exploits during Halloween. Their job was to scare people. There were some who thought these citizens were mean. They’re scary and love to make people scream. That’s mean, right? Not if scary is their job. Some people may think leaders are mean. When you have to demand results, you may come across as angry or mean. But you’re not. You’re out looking for results. You want to make sure your organization is doing what needs to be done. Sometimes that requires being mean or misunderstood. Don’t stop leading because people may misinterpret it for meanness. Jack Skellington was one of the best scarers of Halloween Town. He had fantastic ideas that brought terror to normal people. The mayor and other citizens looked up to him. They saw him as the be-all, end-all of Halloween. Yet Jack felt something was missing. He had grown weary of the sounds of screaming. He was good at scaring but scaring become old and repetitive. Do you ever feel like Jack? Do you feel your work has become routine or monotonous? Many leaders become tired of doing the same type of work over and over again. They believe they’ll never regain the satisfaction they once gained from leading. The feeling of weariness affects us all. Embrace it. Then look for ways to break free. Jack was so good at scaring people believed he loved what he was doing. As he tried to explain he wanted to do something different, his friends couldn’t understand why he would choose to do anything else. However, Jack knew there was more to life than what he was good at. He wanted more, even if others didn’t understand him. You have probably felt similar to Jack Skellington. You’re so good you can’t seem to lose. Those around you see your excellence and can’t understand why you’d want to do anything else. Yet you do. There’s a pull inside of you to try something new. To go a different way. Other people won’t understand your desire to try something new. Don’t let their ignorance stop you from pursuing a passion project. In one of the musical numbers of The Nightmare Before Christmas, Jack was singing about how he was alone. No one felt the same way he did. The audience sees the truth. There are people who feel the same way. Sally (Catherine O’Hara) was watching Jack sing and she nodded in agreement. She also verbally agreed with him. Leadership can be lonely. You will feel like you’re all alone. No one understands you and no one else is in your position. But you’re wrong when you feel this way. There are plenty of people who have been exactly where you are now. Stop thinking you’re alone. You are not. There are others like you out there. Halloween had ended the day before yet the Mayor (Glenn Shadix) was already planning next year’s Halloween scares. He approached Jack and asked for help. Planning early and often will do you a world of good. You can get out in front of what’s coming. You can also lay the groundwork for what you want to do. Make sure you’re laying out plans for the future. Doing so allows you to see where you’re going. One of the reasons Jack was feeling down was the dreariness of Halloween. Halloween was dark. Black and white were the main colors. When Jack entered Christmas Town, he saw a whole new world. There were bright colors. Reds, greens, yellows, and more. The colors were vibrant. They brought cheer and happiness to an otherwise dreary Jack. And he loved it. What colors are in your office or home? Do these colors bring out cheer and happiness? Or do they bring about depression? Look at ways to revitalize where you work. Bringing in color can do a world of wonder to an otherwise oppressive place. The scientist Dr. Finkelstein (William Hickey) had created Sally, much like Dr. Frankenstein created Frankenstein’s monster. In doing so, Dr. Finkelstein believed he owned Sally. He could control her. After all, he had made her. He was his. But Sally pushed and resisted. She didn’t want any part of Dr. Finkelstein. You may have put together a tremendous team. A team that works so well together and gets results done. You’re proud of them. Because of this, you may begin feeling entitled to their loyalty. Your team belongs to you, right? You don’t own your team. They’re in your employ. But they are not yours. Make sure you realize this. Jack’s visit made him think the citizens of Halloween Town should take over Christmas. They could bring all sorts of joy and happiness to little boys and girls around the world. Their ideas were off-base. Really off-base. These ideas petrified the gift recipients. The citizens didn’t understand regular children. They only thought of themselves. Think about what your team might like. Now think about what you would like. Are these the same things? Then you’re not understanding the people who are working for you. Many times their desires will differ from yours. Be willing to find out what your team wants and needs. Doing so will help you motivate your team in an effective way. The citizens of Halloween Town became worried about Jack. They noticed he wasn’t his normal self. He hadn’t come out of his house for a long time. This wasn’t normal behavior. It’s also a behavioral change that was noticed by those around Jack. You may think people don’t know when something is wrong with you or the organization. But I can guarantee you they know. Your attitude and demeanor changes. You may not come out of the office as much. Or you may use terse words. People will notice when something is wrong. Don’t hide this fact. Own it. Share what you can. This will help your team relate to you and understand what’s going on. Jack had formulated a plan. He would take over the role of Santa Claus (Edward Ivory), or Sandy Claws as Jack liked to call him. To do this, he called in three boys: Lock (Paul Reuben – Pee-Wee Herman guys! ), Shock (Catherine O’Hara), and Barrel (Danny Elfman). The boys originally planned ways to kidnapped Santa individually. One of the boys then remembered Jack had told them to work together. As they began to work together, their plan worked. They were able to kidnap Santa and help Jack take over Christmas. It’s amazing the power of a cohesive team. When teams work together, they can accomplish more than they can alone. Teamwork makes the work each individual does more effective. Their work begins to become stronger and better. The plan to take over Christmas was in full effect. Yet there was something nagging at Sally. She’d had a dream where Jack was burning. This dream was so disturbing, she brought her dream to him. He disregarded her warnings and assigned her a role in the Christmas hijinx. Low and behold, Sally’s dream came true. Jack’s sleigh would be shot down and he would be in a burning pile of rubble. Leaders have to take time to listen to those they lead. The people you lead are able to see danger coming long before you do. They’re on the front lines! Don’t disregard those who come to you with concerns. Their concerns may prevent a tragedy from happening. Try again. Don’t give up. Halloween was beginning to mix with Christmas. The citizens were busy doing their jobs. One of those was to make a hat. The hat maker had used a rat to create a hat. Jack saw this and told the hat maker to try again. He also suggested using a bat for the hat. Great leaders encourage their teams when things don’t come together the way they expected. They know things can improve and be done again. Encourage your team. Let them know failure isn’t final. And you believe in them. The big problem with Jack is he desired to be something he wasn’t. He wanted to be Sandy Claws. He was tired of being Jack. He wasn’t a good Santa Claus. But he was great at being Jack. You will feel pulled to try the latest and greatest thing. To be the next Michael Hyatt or Dan Miller or Joseph Michael. However, you’re not them. You are unique and you have your own skill set. Stop trying to be like another leader. Be yourself. Halloween Town brought fear to Christmas. The gifts were ghoulish and freaky. They weren’t what Christmas was about. Fear and scares worked for Halloween. They didn’t work for Christmas. Christmas requires cheer and goodwill. Fun presents under the tree. Joy and happiness. When trying to bring in what worked for Halloween, they almost ruined Christmas. There are plenty of leadership theories and methods out there. Not all will work for you or your organization. 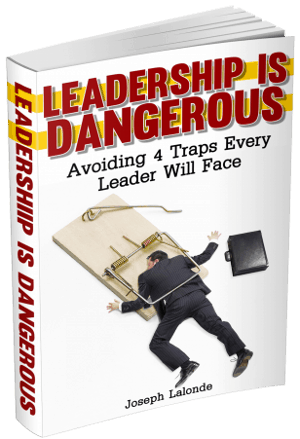 You will have to wade through plenty of leadership material before you find what will work for your organization. Don’t be dismayed when you have to go back to the drawing board. Know you’ll find something or create something that will work for you. Jack truly believed he was doing what was right. By bringing a little bit of fright to Christmas, he thought the people would love it. He was wrong. This was Jack’s blindspot. He knew what he was good at and thought it would work everywhere. Do you know your blindspot? You probably don’t. That’s why it is a blind spot! However, you do have people around you who can see your blind spots. Allow them to speak into your leadership. Ask them to be open and honest with you. This will take your leadership to the next level. While Jack almost ruined Christmas, there was still a bright side to his work. The children would have interesting stories to tell for years to come. When something goes wrong in your organization, do you look at the negative aspects of it? Or do you look on the bright side? There’s always a positive spin you can put on a negative situation. Look for it and help it become the bright spot. Jack realized he had done wrong. Christmas was almost there and the children were unhappy. What did he do? He went to work on making things right. He found Santa Claus who was being tortured by Oogie Boogie (Ken Page). Then he helped get Santa back to Christmas Town. Lastly, presents were distributed to waiting children. Things will break under your leadership. Your responsibility is to help make things right. To fix what you broke. Look for solutions when things go wrong. Then implement action to fix things. Question: Have you seen The Nightmare Before Christmas? If you have, what leadership lessons did you take away from the movie? If you haven’t seen the movie, what leadership lessons from The Nightmare Before Christmas resonated with you the most? Share your thoughts in the comment section below.